By the eighteenth century, Great Britain was reaping monumental financial rewards from the transatlantic slave trade. 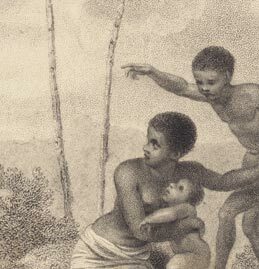 The transatlantic slave trade, commonly known as the triangular slave trade, was composed of three parts: European goods were traded for African slaves; African slaves were sold in the Americas for plantation crops; plantation crops were transported for sale and consumption in Europe. In the seventeenth and eighteenth centuries, slavery had few opponents in England. Indeed, English society valued the slave trade for its significant contribution to the nation’s wealth, and romanticized the adventurous lives of traders on the high seas. In the late eighteenth century, however, Quakers and other religious leaders began to change attitudes toward slavery by drawing attention to the inhumanity and cruelty of the slave trade. One of most effective voices against slavery in England was Thomas Clarkson (1760-1846). Clarkson, along with the abolitionist Granville Sharpe, established the Society for the Abolition of the Slave Trade in 1787. To expose the barbarity of the slave trade, Clarkson gathered evidence, such as the tools of torture used on slave ships, and interviewed thousands of slave ship sailors. He also developed powerful allies, such as M.P. William Wilberforce, who used his political influence to lobby for abolitionist causes in Parliament. Clarkson, Granville, Wilberforce, and other activists began spreading their message. They published protest pamphlets, raised funds, and organized public lectures and rallies. Twenty years after the founding of the Society for the Abolition of the Slave Trade, their work was partially rewarded by the passage of the Abolition of the Slave Trade Act in 1807. This act prohibited Great Britain from participating in the transatlantic slave trade.